As Google rolls more features and functions into Google+, marketing on the new and fast growing social media network is increasingly important. Last week, Google announced the launch of Google+ Local, which provides users with recommendations and information about local businesses including restaurants and retailers. The service looks like a combination of Google Places and Yelp! and seems like it could potentially create new marketing opportunities for businesses. Google+ Local is the most recent update to the search company’s growing social network. Google had previously integrated its profiles with Google+, included Google+ content in search results — more on this below — and more closely aligned Google+ with the popular Gmail service. Earlier this year Google+ reached 100 million users, including about 44 million in the U.S. It had taken the new social media network seven months to reach the milestone. By comparison, Facebook took four and a half years to reach 100 million; Twitter took five years and two months to reach 100 million; and LinkedIn took eight years and ten months to acquire 100 million users. Beyond user count, Google+ content, as mentioned above, is included in Google’s search results. So having good Google+ presence may improve how a business performs in organic search results. 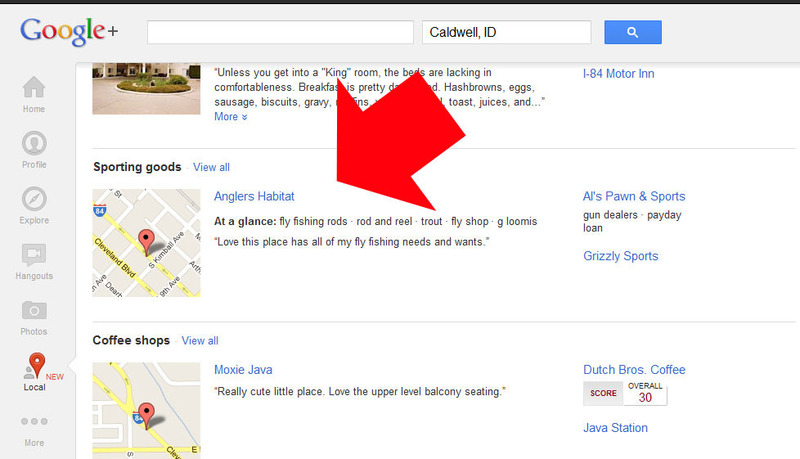 Google integrates Google+ content into search results pages. Whether or not Google+ integration in search results is truly radical, it should be considered. Google+ offers a few opportunities for marketers. Just like on Facebook or Twitter, marketers can easily publish content, offer discounts, or otherwise encourage links on Google+. There are no character limits, and integrating video, particularly video hosted on YouTube is seamless. For example, clothing retailer H&M — one of the most popular brands on Google+ — recently published a 31-photo Autumn and Winter “lookbook,” featuring some of the company’s forthcoming products. 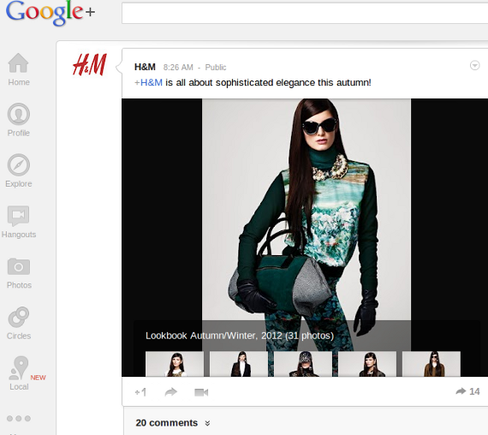 H&M’s Google+ page can be a good example for marketers. Similarly, the Amazon Google+ page, which has nearly 300,000 users following it, frequently offers discounts or specials. 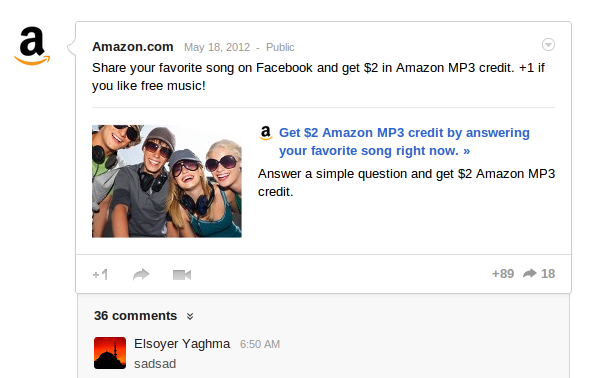 Amazon is actively publishing content, including offering discounts for interaction, on its Google+ page. Google+ also offers “Hangouts,” which are similar to hosting an online meeting. Businesses could use Hangouts to introduce new products, put a very human and responsive face on customer service, or get immediate feedback from customers. As a third marketing idea, Google+ is very friendly to photography, making it easy to upload images and display those images. Retailers, as an example, can post new products image or even insider photography. I have a couple of Google+ marketing concerns. For example, some studies indicate that Google+ users only spend about three minutes a day using the service, which is very low in the context of social media engagement. A second concern is that Google+ does not allow posts from third-party tools. This means that there is presently no way to automate posts. Perhaps, this is intentional since some have argued that automated social media posts broadcast to every possible channel are simply a new form a spam. Google+ is growing both in terms of features and users. Marketers interested in engaging customers where they are might be wise to use Google’s social network.